Millions of workers in middle America have seen their wages plunge -- a concerning trend that helps explain why Donald Trump's message of "bringing the jobs back" from Mexico resonates with so many. These 38 million workers are not entirely blue or white collar, but they've seen their wages fall by more than anyone else -- and many of them live in areas where Trump has polled well at times this year. It's called the "middle skill" workforce -- people with some college experience or an associate's degree. 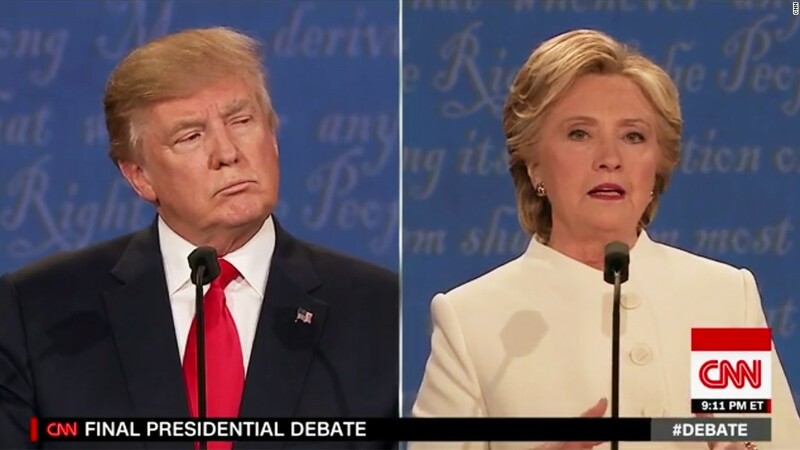 "You find a lot of these workers in parts of the Midwest and the South that are at least leaning Trump right now," says Alan Berube, deputy director of the Metropolitan Policy Program at the Brookings Institution. Lack of jobs and wage losses are key factors fueling the fire behind Trump's popularity among voters, especially those who work in manufacturing, trade and retail. The latest analysis of the nation's wage trends illuminates why Trump's rhetoric can be so popular. Overall, incomes dropped 8% for middle-skill Americans between 2007 and 2015, according to Brookings. That's worse than the declines experienced by those with only a high school diploma (-6%) or with a college degree (-4%). But the overall numbers only scratch the surface. When you drill down into some key cities, workers' wages were ravaged. 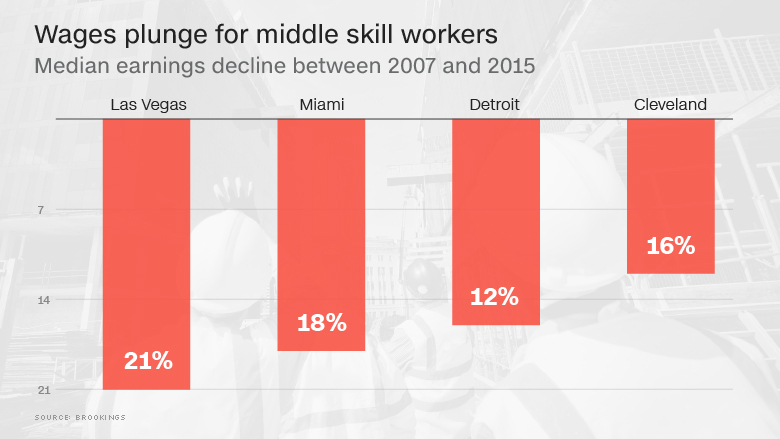 In the Las Vegas metro area, income dropped 21% for 290,000 middle-skill workers from 2007 to 2015. In three California cities -- San Diego, Stockton and Riverside -- wages dropped by 18%. And in Miami's metro area, 700,000 workers lost 18% of their wages. Incomes fell by the same amount in Richmond, Va. And in several Midwest cities, such as Indianapolis, Cincinnati and Toledo, there were double-digit declines. "These are the workers that play a big role in producing the things that we use and consume," says Berube. "A lot of those jobs are threatened by automation." Out of the top 94 metro areas, 71 recorded significant wage drops for middle-skills workers. In fact, not a single metro area saw wages increase for this group between 2007 and 2015. It's not only falling wages. This cohort of workers are also the most likely to default on their student debt, according to the New York Federal Reserve. Over 30% of student loan borrowers with $5,000 or less in debt default on their loans -- the highest default rate of any group. Despite these grim findings, Berube of Brookings says he would not discourage workers from seeking a 2-year degree or vocational training. He advocates for prospective students to seek out skills and job training that are high in demand, and points towards advanced manufacturing education in Kentucky as a prime example. Matching these struggling workers with job training and opportunities is a task best for local leaders who know their local economy, Barube argues. "Getting these people the right types of skills and the right types of jobs is up to cities and states to tackle," he says.